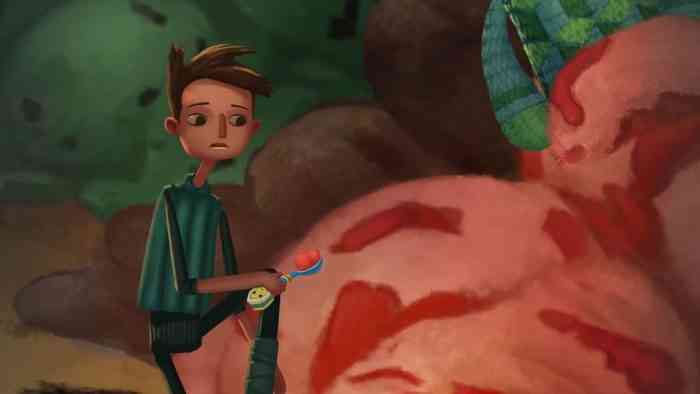 Playing Broken Age is like interacting with a children’s book come to life. The gorgeous art style and paintbrush visuals are like nothing that has come before, and the witty writing and funny dialogue made me anxious and excited whether I was solving one of its many puzzles or uncovering the next plot point. Its charm is utterly irresistible, and it’s another knockout point-and-click adventure from the creative mind of the legendary Tim Schafer and his team at Double Fine. Broken Age has been kicking around for the better part of three years now, having first launched on PC and Mac after its documented and hugely successful Kickstarter campaign in 2014. It trickled out onto the PlayStation 4 and Vita in 2015 and is only now making an appearance on Xbox One. There really isn’t any point in double-dipping if you’ve played it before on a previous platform, but if you’re strictly an Xbox owner then Broken Age is an absolute must play. 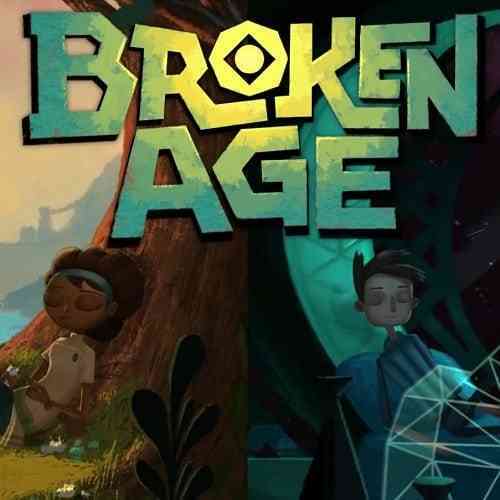 Broken Age is er, broken up into two seemingly unrelated playable campaigns starring two different characters: Vella and Shay. Both chapters are immensely enthralling with excellent characterization, hilarious interactions, and entertaining puzzles and scenarios. Vella — voiced by Masasa Moyo — is celebrating the Maidens Feast with her family in her hometown of Sugar Bunting. She is to be given up as a sacrifice to a creature known as Mog Chothra as a sign of peace. Vella, on the other hand, is against being gobbled up and attempts to put an end to this tradition. Meanwhile, Shay — who is voiced by Elijah Wood — lives alone on the automated spaceship known as Bossa Nostra with an overprotective artificial intelligence computer acting as both a mother and father figure. The AI tasks Shay with simulated rescue missions that always makes him up to be a hero and are designed to keep him from finding out anything else beyond the great unknown. Shay is adamant to break free from his monotonous lifestyle and well, that’s exactly what happens so to speak. The events kick off a series of wild, perplexing, and engaging situations that pulled me in quickly. I’m not one to spoil a good story for anyone interested, but I’ll simply add that both protagonists’ stories are excellent and it’s masterful just how both connect and intersect with one another. Getting to know Vella and Shay is joyful and oddly relatable, and seeing them interact with their surroundings, both familiar and new, felt in tune with my own feelings. Engaging with all of the quirky NPCs is a delight, and I couldn’t ask for more top-notch voice acting. Getting Vella to convince a paranoid talking tree for sap or having Shay stay silent while a sentient spoon tried convincing him to put him in his mouth had me in stitches. Many times over, I would try out all of my items from my inventory on the NPCs just to hear what they would have to say; the dialogue is just that entertaining. Some may frown at the linear nature of the dialogue but it never bothered me because the writing is just so darn good. Unlike the PC versions that were released in two parts, console buyers get the complete package so there’s no need to agonize over the story twists for months on end. As witty as the script can get, there are also moments of poignancy that I never expected. 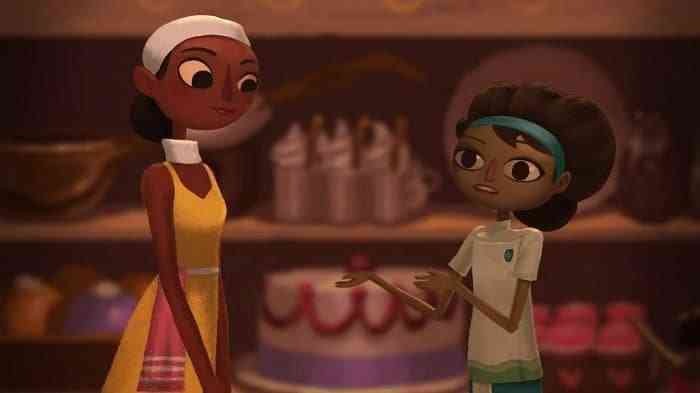 In the end, amidst all of the silliness of its world, Broken Age boils down to a riveting coming of age story. Broken Age shows its ambitious side by allowing players to seamlessly jump between both characters without interruption. You can start the game playing as Vella, and switch to Shay at any time or vice versa. This is especially handy when faced with a tricky puzzle, and even more impressive to witness just how snappy it is with no loading screen. What I loved most about this concept is how it kept me guessing for the first half as to when and how these characters will meet. If it wasn’t for the distinct art style giving it away, I would have thought I was playing two different games. Broken Age isn’t an overly lengthy game, nor are there any narrative differences to warrant repeat playthroughs, but what is on display is an incredibly polished and memorable adventure game that should be experienced by anyone who has a slight interest in games. Back on the topic of puzzles, since this is a point-and-click adventure from the man that basically pioneered the genre, you better believe Broken Age has them. I should preface that Broken Age isn’t a hard game. 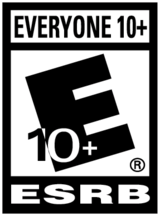 In fact, it’s definitely on the easy side but not once did I complain since Broken Age isn’t meant to stump players. Puzzle solutions are always a few short minutes away and long gone are the genre’s nonsensical conundrums that have plagued gamers for years. If there’s anything that irked me about the puzzles is that sometimes I had to backtrack to a previous area to obtain an item that I got ridden of prior or some may require precise timing to accomplish. Slight annoyance aside, it wasn’t enough for me to moan about it, especially when everything else is so spot on. Everything about Broken Age pleased and satisfied me as an adventure game and Tim Schafer fan. It’s smart, the jokes are funny, and the story is incredible with some excellent twists. I fell in love with its canvas visuals and character interactions, making this one of my favorite point-and-click adventure games in recent memory. It plays wonderfully on console and its charm is never lost. Its relatively short length isn’t a detriment in the slightest; It only encouraged me to fall for it over and over again.